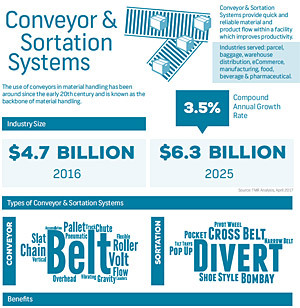 The Conveyor & Sortation Systems (CSS) members are the Industry’s leading providers of conveyors and sortation systems which also includes Vertical Reciprocating Conveyers (VRCs). 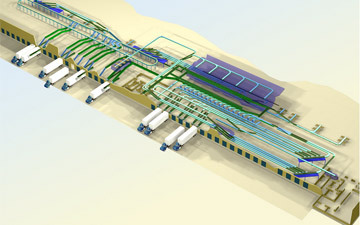 They design, fabricate and install conveyor and sortation systems worldwide and in virtually every major manufacturing and distribution sector. 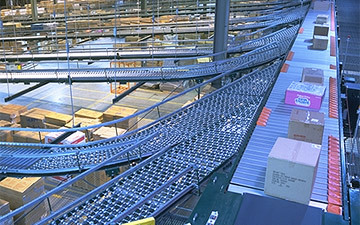 CSS prepares and distributes educational and promotional materials regarding the proper application and benefits of conveyor and sortation system solutions. Mission: To promote the market growth and effective use of conveyor and sortation systems in manufacturing, warehousing, distribution and other key markets. 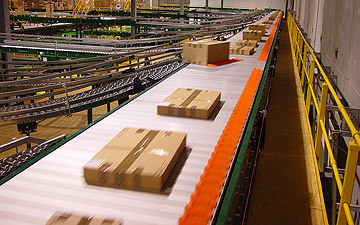 A conveyor is a horizontal, inclined or vertical device commonly used in manufacturing and distribution facilities to move material, packages or objects. 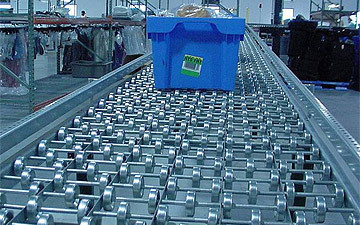 Conveyors usually consist of a looped belt or chain moving along a pre-determined path and having points of loading and discharge, fixed or selective. 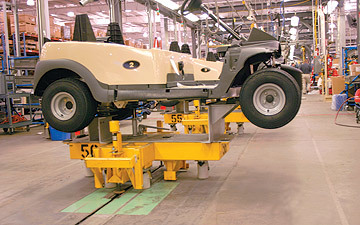 A sortation system merges, identifies, inducts, separates and conveys products to specific destinations. 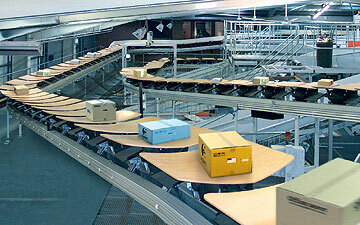 Conveyors and sortation systems allow for more efficient retail, wholesale, and manufacturing distribution. They are also a labor saving system that allows large volumes or material and/or product to move and be sorted rapidly through a process, allowing companies to ship or receive higher volumes with smaller storage space and with less labor expense. Working closely with user groups to communicate needs, benefits and applications. Acting as a catalyst and liaison between different related product groups or associations. Maintaining a membership representative of the industry. Promoting the general welfare of the industry. Providing a market driven forum for material flow solutions. Collecting, compiling, disseminating and exchanging information and statistics which may be helpful to the membership. Preparing and distributing educational materials for both academic classroom environments and in continuing education. The Material Handling Education Foundation, Inc. has awarded the $2,500 Conveyor & Sortation Systems Honor Scholarship to Jessica Robey at Michigan State University. Jessica is a Master’s Degree student majoring in Global Supply Chain Management. Her undergraduate degree was in Accounting, but she never felt fulfilled in the accounting function. She is currently employed full-time as a Supply Chain Finance Business Partner, Americas were she contributes by reducing waste and adding value enhancing metrics. Once she was exposed to supply chain concepts, she was hooked and knew she had to learn more about the global supply chain. She plans to enter the workforce after graduation.